When Rapunzel meets Flynn Rider, the two of them go on an adventure so she can finally live her dream. 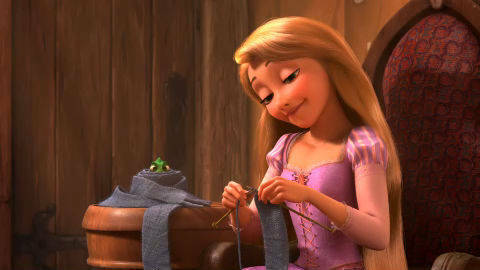 Flynn is an experienced thief, but as he begins to fall in love with Rapunzel, he changes his priorities. Mother Gothel has always been a motherly figure. However, the floating lights from the castle start to raise questions. Maximus is a dedicated guard horse, but he has a large heart and together with Flynn helps to reunite Rapunzel with her family. Run, jump, and climb to help Flynn and Rapunzel escape the guards and Maximus. Meet Rapunzel, a beautiful tower-bound teen and Flynn Rider, a handsome thief who helps her escape, and their action-packed adventure. Rapunzel (Mandy Moore) sings When Will My Life Begin in Disney's Tangled. Let your hair down and get creative in the comfort of your own castle!